GMED is a global marine environment dataset with climatic, biological and geophysical environmental layers of both present days, past and future environmental conditions. Data layers were compiled together into a uniform Geographic Informations System ready dataset having a similar extent and spatial resolution (5 arc-minute, approx. 9.2 km). The GMED dataset is ready to use with popular species distribution modeling (SDM) software and for any other marine environment visualization exercises. 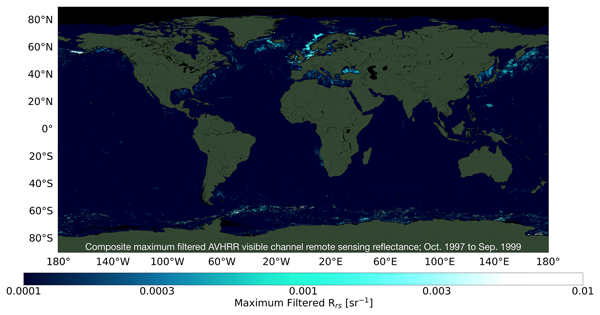 A 40-year data set of ocean reflectance is derived from an atmospherically corrected climate quality record of top-of-atmosphere signals taken from the satellite-based AVHRR sensor. The data set provides a unique view of visible changes in the global ocean over timescales where climatic effects are demonstrable and spans coverage gaps left by more traditional satellite ocean colour sensors. It is particularly relevant to monitoring bright plankton blooms, such as coccolithophores. The photosynthetic response of marine phytoplankton to available irradiance is a central part of satellite-based models of ocean productivity. This study brings together data from a variety of oceanographic campaigns to examine how the parameters of photosynthesis–irradiance response curves vary over the global ocean. This global synthesis reveals biogeographic, latitudinal and depth-dependent patterns in the photosynthetic properties of natural phytoplankton assemblages. Autonomous robotic platforms such as Biogeochemical-Argo floats allow observation of the ocean, from the surface to the interior, in a new and systematic way. A fleet of 105 of these platforms have collected several biological, biogeochemical, and optical variables in still unexplored regions. The quality-controlled databases presented here will enable scientists to improve knowledge on the functioning of marine ecosystems and investigate the climatic implications. KRILLBASE is a data rescue and compilation project to improve the availability of information on two key Southern Ocean zooplankton: Antarctic krill and salps. We provide a circumpolar database that combines 15 194 scientific net hauls (1926 to 2016) from 10 countries. These data provide a resource for analysing the distribution and abundance of krill and salps throughout the Southern Ocean to support ecological and biogeochemical research as well as fisheries management and conservation. We compiled data to understand the organization of marine zooplankton based on their fundamental traits, such as body size or growth rate, rather than based on species names. Zooplankton, and in particular the dominant crustacean copepods, are central to marine food webs and the carbon cycle. The data include 14 traits and thousands of copepod species and may be used for comparisons between species or communities and ultimately to inspire better large-scale models of planktonic ecosystems. A compiled set of in situ data is important to evaluate the quality of ocean-colour satellite data records. Here we describe the compilation of global bio-optical in situ data (spanning from 1997 to 2012) used for the validation of the ocean-colour products from the ESA Ocean Colour Climate Change Initiative (OC-CCI). The compilation merges and harmonizes several in situ data sources into a simple format that could be used directly for the evaluation of satellite-derived ocean-colour data. The exponential growth of studies on the biological response to ocean acidification over the last few decades has generated a large amount of data. To facilitate data comparison, a data compilation was initiated in 2008 and is updated on a regular basis. By January 2015, a total of 581 data sets (over 4,000,000 data points) from 539 papers had been archived. With the rapid expansion of studies on biological responses of organisms to OA, the lack of a common metadata template to document the resulting data poses a significant hindrance to effective OA data management efforts. In this paper, we present a metadata template that can be applied to a broad spectrum of OA studies, including those studying the biological responses of organisms to OA. This paper defines best practices for documenting ocean acidification (OA) data. This work describes a 148-year compilation of stomach content data for five pelagic fish species (herring, blue whiting, mackerel, albacore and bluefin tuna) sampled over a broad geographic region of the northeast Atlantic. We describe the main results in terms of diet composition and predator–prey relationships. The analyses suggests significant differences in the prey items selected by predators in different parts of the area at different times of year. 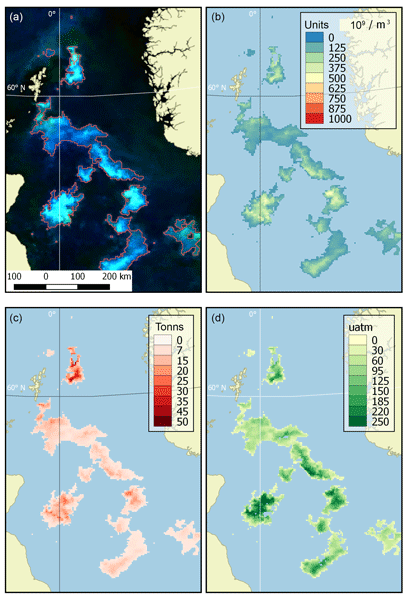 Global marine plankton functional type biomass distributions: Phaeocystis spp. Allen, G. R.: Conservation hotspots of biodiversity and endemism for Indo-Pacific coral reef fishes, Aquat. Conserv., 18, 541–556, 2008. Allen, G. R. and Erdmann, M. V.: Reef fishes of the East Indies. Mobile Application Software, Version 1.1 (Rev.10.2016), available at: https://geo.itunes.apple.com/us/app/reef-fishes-east-indies-vol./id705188551?mt=8(9). (last access: 15 June 2016), 2013. Alsheikh-Ali, A. A., Qureshi, W., Al-Mallah, M. H., and Ioannidis, J. P.: Public availability of published research data in high-impact journals, PloS One, 6, e24357, https://doi.org/10.1371/journal.pone.0024357, 2011. Asaad, I., Lundquist, C. J., Erdmann, M. V., and Costello, M. J.: Ecological criteria to identify areas for biodiversity conservation, Biol. Conserv., 213, 309–316, https://doi.org/10.1016/j.biocon.2016.10.007, 2016. Asaad, I., Lundquist, C. J., Erdmann, M. V., and Costello, M. J.: Delineating priority areas for marine biodiversity conservation in the Coral Triangle, Biol. Conserv., 222, 198–211, https://doi.org/10.1016/j.biocon.2018.03.037, 2018a. Asaad, I., Lundquist, C. J. L., Erdmann, M. V. E., Hooidonk, V., Van Hooidonk, R., and Costello, M. J. : Designating spatial priorities for marine biodiversity conservation in the Coral Triangle, Frontiers In Marine Science, 5, 400, https://doi.org/10.3389/fmars.2018.00400, 2018b. Basher, Z., Bowden, D. A., and Costello, M. J.: Global Marine Environment Datasets (GMED)-World Wide Web electronic publication, Ver. 1.0 (Rev.01.2014), available at: http://gmed.auckland.ac.nz (last access: 1 June 2016), 2014. Barale, V., Assouline, M., Dusart, J., and Gaffuri, J.: The European atlas of the seas: relating natural and socio-economic elements of coastal and marine environments in the European Union, Mar. Geod., 38, 79–88, 2015. Bisby, F. A.: The quiet revolution: biodiversity informatics and the internet, Science, 289, 2309–2312, 2000. Clarke, K. C.: Maps & Web Mapping, Pearson Education, New York, 2014. Costello, M. J.: Motivating online publication of data, BioScience, 59, 418–427, 2009. Costello, M. J. and Vanden Berghe, E.: 'Ocean biodiversity informatics'; A new era in marine biology research and management, Mar. Ecol. Prog. Ser., 316, 203–214, https://doi.org/10.3354/Meps316203, 2006. Costello, M. J., Michener, W. K., Gahegan, M., Zhang, Z.-Q., and Bourne, P. E.: Biodiversity data should be published, cited, and peer-reviewed, Trends Ecol. Evol., 28, 454–461, 2013. Cros, A., Fatan, N.A., White, A., Teoh, S.J., Tan, S., Handayani, C., Huang, C., Peterson, N., Li, R.V., Siry, H.Y., Fitriana, R., Gove, J., Acoba, T., Knight, M., Acosta, R., Andrew, N., and Beare, D.: The Coral Triangle Atlas; An Integrated Online Spatial Database System for Improving Coral Reef Management, Plos One, 9, e96332, https://doi.org/10.1371/journal.pone.0096332, 2014. CTI-CFF: The Regional Plan of Action of the Coral Triangle on Coral Reefs, Fisheries and Food Security (CTI-CFF) Initiative, The secretariat of CTI-CFF Initiative, Jakarta, Indonesia, 2009. CTI-CFF: Coral Triangle Marine Protected Area System Framework and Action Plan, CTI-CFF, United States Agency for International Development Coral Triangle Support Partnership and US National Oceanic and Atmospheric Administration, Cebu City, The Philippines, 2013. ESRI: ArcGIS Desktop Ver.10.5, ESRI, Redlands, CA, 2016. ESRI: ArcGIS Pro Ver. 2.0, ESRI, Redlands, CA, 2017. Froese, R. and Pauly, D.: FishBase, World Wide Web electronic publication, Ver. (06/2016), available at: http://www.fishbase.org, last access: 1 June 2016. Fu, P. and Sun, J.: Web GIS; Principles and applications, ESRI Press, Redlands, CA, 2010. GBIF: https://www.gbif.org, last access: 1 April 2018. GBIF: Darwin Core Archives – How-to Guide, Ver. 1 Released on 1 March 2010, contributed by: Remsen, D., Braak, K., Döring, M., Robertson, T., Global Biodiversity Information Facility, Copenhagen, 21 pp., 2010. Giri, C., Ochieng, E., Tieszen, L., Zhu, Z., Singh, A., Loveland, T., Masek, J., and Duke, N.: Status and distribution of mangrove forests of the world using earth observation satellite data, Global Ecol. Biogeogr., 20, 154–159, 2011a. Giri, C., Ochieng, E., Tieszen, L., Zhu, Z., Singh, A., Loveland, T., Masek, J., and Duke, N.: Global distribution of mangroves forests of the world using earth observation satellite data, in: Supplement to: Giri et al. (2011a), UNEP World Conservation Monitoring Centre, Cambridge, UK, available at: http://data.unep-wcmc.org/datasets/4 (last access: 1 June 2016), 2011b. Green, A., Smith, S. E., Lipsett-Moore, G., Groves, C., Peterson, N., Sheppard, S., Lokani, P., Hamilton, R., Almany, J., and Aitsi, J.: Designing a resilient network of marine protected areas for Kimbe Bay, Papua New Guinea, Oryx, 43, 488–498, 2009. Guiry, M. D. and Guiry, G. M.: AlgaeBase, World-wide electronic publications, National University of Ireland, Galway, available at: http://www.algaebase.org/, last access: 1 August 2018. Halpern, B. S., Walbridge, S., Selkoe, K. A., Kappel, C. V., Micheli, F., D'Agrosa, C., Bruno, J. F., Casey, K. S., Ebert, C., Fox, H. E., Fujita, R., Heinemann, D., Lenihan, H. S., Madin, E. M. P., Perry, M. T., Selig, E. R., Spalding, M., Steneck, R., and Watson, R.: A global map of human impact on marine ecosystems, Science, 319, 948–952, https://doi.org/10.1126/science.1149345, 2008. Halpern, B. S., Frazier, M., Potapenko, J., Casey, K. S., Koenig, K., Longo, C., Lowndes, J. S., Rockwood, R. C., Selig, E. R., and Selkoe, K. A.: Spatial and temporal changes in cumulative human impacts on the world's ocean, Nat. Commun., 6, 7615, https://doi.org/10.1038/ncomms8615, 2015a. Halpern, B. Frazier, M., Potapenko, J., Casey, K. S., Koenig, K., Longo, C., Lowndes, J. S., Rockwood, R. C., Selig, E. R., and Selkoe, K. A.: Cumulative human impacts: raw stressor data (2008 and 2013), https://doi.org/10.5063/F1S180FS 2015b. Hamylton, S. M.: Spatial Analysis of Coastal Environments, Cambridge University Press, Cambridge, UK, 2017. Heidorn, P. B.: Biodiversity informatics, Bulletin of the Association for Information Science and Technology, 37, 38–44, 2011. Hoeksema, B. W.: Delineation of the Indo-Malayan centre of maximum marine biodiversity: the Coral Triangle, in: Biogeography, time, and place; Distributions, barriers, and islands, edited by: Renema, W., Springer, The Netherlands, 117–178, 2007. Horton, T., Kroh, A., Bailly, N., Boury-Esnault, N., Brandão, S. N., Costello, M. J., Gofas, S., Hernandez, F., Mees, J., Paulay, G., Poore, G., Rosenberg, G., Stöhr, S., Decock, W., Dekeyzer, S., Vandepitte, L., Vanhoorne, B., Vranken, S., Adams, M. J., Adlard, R., Adriaens, P., Agatha, S., Ahn, K. J., Ahyong, S., Akkari, N., Alvarez, B., Anderson, G., Angel, M., Arango, C., Artois, T., Atkinson, S., Barber, A., Barbosa, J. P., Bartsch, I., Bellan-Santini, D., Berta, A., Bieler, R., Błażewicz, M., Bock, P., Böttger-Schnack, R., Bouchet, P., Boyko, C. B., Bray, R., Bruce, N. L., Cairns, S., Campinas Bezerra, T. N., Cárdenas, P., Carstens, E., Cedhagen, T., Chan, B. K., Chan, T. Y., Cheng, L., Churchill, M., Coleman, C. O., Collins, A. G., Cordeiro, R., Crandall, K. A., Cribb, T., Dahdouh-Guebas, F., Daly, M., Daneliya, M., Dauvin, J. C., Davie, P., De Grave, S., de Mazancourt, V., Decker, P., Defaye, D., d'Hondt, J. L., Dijkstra, H., Dohrmann, M., Dolan, J., Downey, R., Drapun, I., Eisendle-Flöckner, U., Eitel, M., Encarnação, S. C. d., Enghoff, H., Epler, J., Ewers-Saucedo, C., Faber, M., Feist, S., Finn, J., Fišer, C., Fonseca, G., Fordyce, E., Foster, W., Frank, J. H., Fransen, C., Furuya, H., Galea, H., Garcia-Alvarez, O., Gasca, R., Gaviria-Melo, S., Gerken, S., Gheerardyn, H., Gibson, D., Gil, J., Gittenberger, A., Glasby, C., Glover, A., Gordon, D., Grabowski, M., Gravili, C., Guerra-García, J. M., Guidetti, R., Guilini, K., Guiry, M. D., Hajdu, E., Hallermann, J., Hayward, B., Hendrycks, E., Herrera Bachiller, A., Ho, J. s., Høeg, J., Holovachov, O., Hooper, J., Hughes, L., Hummon, W., Hyzny, M., Iniesta, L. F. M., Iseto, T., Ivanenko, S., Iwataki, M., Jarms, G., Jaume, D., Jazdzewski, K., Kaminski, M., Karanovic, I., Kim, Y. H., King, R., Kirk, P. M., Kociolek, J. P., Kolb, J., Kotov, A., Krapp-Schickel, T., Kremenetskaia, A., Kristensen, R., Kullander, S., La Perna, R., Lambert, G., Lazarus, D., Le Coze, F., LeCroy, S., Leduc, D., Lefkowitz, E. J., Lemaitre, R., Lörz, A. N., Lowry, J., Macpherson, E., Madin, L., Mah, C., Mamos, T., Manconi, R., Mapstone, G., Marek, P. E., Marshall, B., Marshall, D. J., McInnes, S., Meidla, T., Meland, K., Merrin, K., Messing, C., Miljutin, D., Mills, C., Mokievsky, V., Molodtsova, T., Monniot, F., Mooi, R., Morandini, A. C., Moreira da Rocha, R., Moretzsohn, F., Mortelmans, J., Mortimer, J., Musco, L., Neubauer, T. A., Neuhaus, B., Ng, P., Nguyen, A. D., Nielsen, C., Nishikawa, T., Norenburg, J., O'Hara, T., Okahashi, H., Opresko, D., Osawa, M., Ota, Y., Patterson, D., Paxton, H., Perrier, V., Perrin, W., Petrescu, I., Picton, B., Pilger, J. F., Pisera, A., Polhemus, D., Pugh, P., Reimer, J. D., Reip, H., Reuscher, M., Rius, M., Rützler, K., Rzhavsky, A., Saiz-Salinas, J., Santos, S., Sartori, A. F., Satoh, A., Schatz, H., Schierwater, B., Schmidt-Rhaesa, A., Schneider, S., Schönberg, C., Schuchert, P., Senna, A. R., Serejo, C., Shamsi, S., Sharma, J., Shenkar, N., Short, M., Sicinski, J., Siegel, V., Sierwald, P., Simmons, E., Sinniger, F., Sivell, D., Sket, B., Smit, H., Smol, N., Souza-Filho, J. F., Spelda, J., Stampar, S. N., Sterrer, W., Stienen, E., Stoev, P., Strand, M., Suárez-Morales, E., Summers, M., Suttle, C., Swalla, B. J., Taiti, S., Tandberg, A. H., Tang, D., Tasker, M., Taylor, J., Tchesunov, A., ten Hove, H., ter Poorten, J. J., Thomas, J., Thuesen, E. V., Thurston, M., Thuy, B., Timi, J. T., Timm, T., Todaro, A., Turon, X., Tyler, S., Uetz, P., Utevsky, S., Vacelet, J., Vader, W., Väinölä, R., van der Meij, S. E., van Soest, R., Van Syoc, R., Venekey, V., Vonk, R., Vos, C., Walker-Smith, G., Walter, T. C., Watling, L., Wesener, T., Whipps, C., White, K., Williams, G., Wilson, R., Wyatt, N., Wylezich, C., Yasuhara, M., Zanol, J., and Zeidler, W.: World Register of Marine Species (WoRMS), WoRMS Editorial Board, available at: http://www.marinespecies.org/, last access: 1 June 2016. IUCN: The IUCN Red List of Threatened Species, Version 2015.4, available at: https://www.iucnredlist.org/, last assess: 19 November 2015. IUCN and UNEP-WCMC: The World Database on Protected Areas (WDPA), UNEP – World Conservation Monitoring Centre, Cambridge, UK, available at: https://www.protectedplanet.net/, last assess: 1 August 2016. Jetz, W., McPherson, J. M., and Guralnick, R. P.: Integrating biodiversity distribution knowledge: toward a global map of life, Trends Ecol. Evol., 27, 151–159, https://doi.org/10.1016/j.tree.2011.09.007, 2012. Kaschner, K., Rius-Barile, J., Kesner-Reyes, K., Garilao, C., Kullander, S. O., Rees, T., and Froese, R.: AquaMaps; Predicted range maps for aquatic species, World Wide Web electronic publication, Version 08/2016, available at: http://www.aquamaps.org/, last assess: 1 August 2016. Kot, C. Y., Fujioka, E., DiMatteo, A., Wallace, B., Hutchinson, B., Cleary, J., Halpin, P., and Mast, R.: The State of the World's Sea Turtles Online Database, Data provided by the SWOT Team and hosted on OBIS-SEAMAP, Oceanic Society, IUCN Marine Turtle Specialist Group (MTSG), and Marine Geospatial Ecology Lab, Duke University, available at: http://seamap.env.duke.edu/swot (last assess: 1 June 2016), 2015. Marchante, H., Morais, M. C., Gamela, A., and Marchante, E.: Using a WebMapping platform to engage volunteers to collect data on invasive plants distribution, T. GIS, 21, 238–252, 2017. Maynard, J. A., Mckagan, S., Raymundo, L., Johnson, S., Ahmadia, G. N., Johnston, L., Houk, P., Williams, G. J., Kendall, M., and Heron, S. F.: Assessing relative resilience potential of coral reefs to inform management, Biol. Conserv., 192, 109–119, 2015. McLeod, E., Moffitt, R., Timmermann, A., Salm, R., Menviel, L., Palmer, M. J., Selig, E. R., Casey, K. S., and Bruno, J. F.: Warming Seas in the Coral Triangle; Coral Reef Vulnerability and Management Implications, Coast. Manage., 38, 518–539, https://doi.org/10.1080/08920753.2010.509466, 2010. Michener, W. K.: Ecological data sharing, Ecol. Inform., 29, 33–44, 2015. Michener, W. K., Brunt, J. W., Helly, J. J., Kirchner, T. B., and Stafford, S. G.: Nongeospatial metadata for the ecological sciences, Ecol. Appl., 7, 330–342, 1997. MoF-MoMAF: Data of the Ecological representation gap analysis for conservation areas in Indonesia, Ministry of Forestry and Ministry of Marine Affairs and Fisheries, Jakarta, Indonesia, 2010. MoMAF: The database of Marine Protected Areas in Indonesia, Ministry of Marine Affairs and Fisheries, Jakarta, Indonesia, 2016. Morets, D.: Internet GIS, in: Encyclopedia of GIS, edited by: Shekhar, S., Xiong, H., and Zhou, X., Springer International, Cham, Switzerland, 1074–1081, 2017. Neumann, A.: Web Mapping and Web Cartography; Encyclopaedia of GIS, Springer, Boston, MA, 1261–1269, 2008. OBIS: Data from the Ocean Biogeographic Information System, Intergovernmental Oceanographic Commission of UNESCO, available at: http://www.iobis.org/, last access: 22 January 2015. Polidoro, B. A., Carpenter, K. E., Collins, L., Duke, N. C., Ellison, A. M., Ellison, J. C., Farnsworth, E. J., Fernando, E. S., Kathiresan, K., Koedam, N. E., Livingstone, S. R., Miyagi, T., Moore, G. E., Vien, N. N., Ong, J. E., Primavera, J. H., Salmo, S. G., Sanciangco, J. C., Sukardjo, S., Wang, Y. M., and Yong, J. W. H.: The loss of species: Mangrove extinction risk and geographic areas of global concern, Plos One, 5, e10095, https://doi.org/10.1371/journal.pone.0010095, 2010. Parr, C. S. and Thessen, A. E.: Biodiversity Informatics, in: Ecological Informatics; Data Management and Knowledge Discovery, edited by: Recknagel, F. and Michener, W. K., Springer International Publishing, Cham, Switzerland, 375–399, 2018. Pauly D. and Zeller D. (Eds. ): Sea Around Us Concepts, Design and Data, available at: http://www.seaaroundus.org/ (last access: 1 April 2018), 2015. Peterson, M. P.: International perspectives on maps and the Internet, Springer, Berlin Heidelberg, 2018. Saeedi, H., Dennis, T. E., and Costello, M. J.: Bimodal latitudinal species richness and high endemicity of razor clams (Mollusca), J. Biogeogr., 44, 592–604, https://doi.org/10.1111/jbi.12903, 2016. Teacher, A. G., Griffiths, D. J., Hodgson, D. J., and Inger, R.: Smartphones in ecology and evolution; A guide for the app-rehensive, Ecol. Evol., 3, 5268–5278, 2013. UNEP-WCMC: The Checklist of CITES Species Website, CITES Secretariat, Geneva, Switzerland, Compiled by UNEP-WCMC, Cambridge, UK, available at: http://checklist.cites.org (last access: 1 February 2016), 2015. UNEP-WCMC and Short, F. T.: Global distribution of seagrasses (version 3.0), 3rd update to the data layer used in Green and Short (2003), UNEP World Conservation Monitoring Centre, Cambridge, UK, available at: http://data.unep-wcmc.org/datasets/7 (last access: 1 June 2016), 2005. UNEP-WCMC, WorldFish Centre, WRI, and TNC: Global distribution of coral reefs, compiled from multiple sources including the Millennium Coral Reef Mapping Project, Version 1.3, updated by UNEP-WCMC, includes contributions from IMaRS USF and IRD (2005), IMaRS-USF (2005) and Spalding et al. (2001), UNEP World Conservation Monitoring Centre, Cambridge, UK, available at: http://data.unep-wcmc.org/datasets/1 (last access: 1 June 2016), 2010. Veron, J., Devantier, L. M., Turak, E., Green, A. L., Kininmonth, S., Stafford-Smith, M., and Peterson, N.: Delineating the Coral Triangle, Galaxea, Journal of Coral Reef Studies, 11, 91–100, 2009. VLIZ: Maritime Boundaries Geodatabase, Version 8, available at: http://www.marineregions.org/ (last access: 22 March 2016), 2014. Van Hooidonk, R., Maynard, J., Tamelander, J., Gove, J., Ahmadia, G., Raymundo, L., Williams, G., Heron, S. F., and Planes, S.: Local-scale projections of coral reef futures and implications of the Paris Agreement, Sci. Rep., 6, 39666, https://doi.org/10.1038/srep39666, 2016. Wright, D., Pendleton, M., Boulware, J., Walbridge, S., Gerlt, B., Eslinger, D., Sampson, D., and Huntley, E.: ArcGIS Benthic Terrain Modeler (BTM), V. 3.0, Environmental Systems Research Institute (ESRI), NOAA Coastal Services Centre, Massachusetts Office of Coastal Zone Management, Redlands, CA, 2012. Wright, D. J. (Ed. ): Ocean Solutions, Earth Solutions, 2nd edn., Esri Press, Redlands, CA, 2016. Wright, D. J, Dwyer, N., and Cummins, V. (Eds. ): Coastal Informatics: Web Atlas Design and Implementation, IGI-Global, Hershey, New York, 2011. Walton, A., White, A. T., Tighe, S., Alino, P. M., Laroya, L., Dermawan, A., Kasasiah, A., Hamid, S. A., Vave-Karamui, A., Genia, V., Martins, L. D., and Green, A. L.: Establishing a functional region-wide Coral Triangle marine protected area system, Coast. Manage., 42, 107–127, https://doi.org/10.1080/08920753.2014.877765, 2014.